Northern Colorado friends you are invited! Join me this weekend, March 27-29th at Bath Garden Center in Fort Collins, Colorado on the corner of Prospect & Timberline. Saturday, March 28th from 4:00-6:00 pm please join me at my Artist Reception. Enjoy snacks, enter to win a free portrait session, meet my new dog Kaylee, and browse and buy original Silver Paw Studio Art. My 3 day art show features art pieces from the Animal House Rescue & Grooming Annual Spring Me Photo Session. Proceeds from all sales to be donated to Animal House. Can’t make it to the show but still want to participate?? Bid now on the Spring Me Art Canvas Wraps on Ebay here. Pet Portrait Event Saturday, April 16, 2016 12:00-3:00. 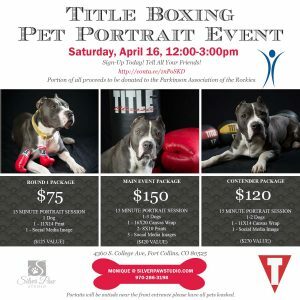 Pose your pup with Title Boxing props! Only 10 spots, register now HERE.